Front Cable Raise: This exercise is what I like to start with. It doesn't take a lot of weight for me to start to feel it either. That is one thing I have noticed about cable work, it does not take a lot of weight to get a good workout. Only up to about 20 lbs on this exercise. Arnold Dumbbell Press: This one is new to me, and I had to be very careful picking the weight I used. If you go too heavy, it can hurt. 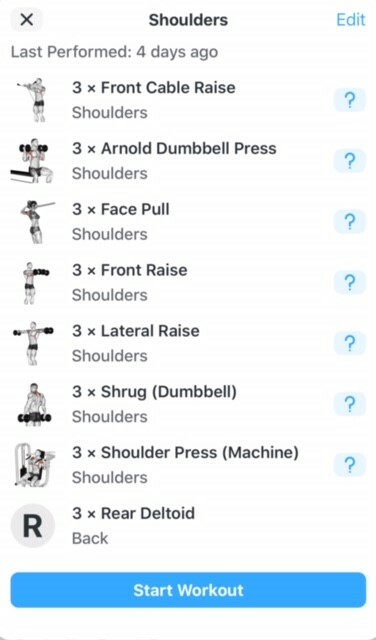 This exercise is supposed to give you those "boulder shoulders" we all want. 30 lbs is my max on this exercise. Face Pull: I like this one a lot, it feels like it also gives you a back workout as well. I am usually at around 50 lbs for this one. Front and Lateral Raise: These jokers can hurt pretty easy. Seems like they both go fairly easy until I get to around 7, then I struggle. I am usually only using around 15-20 lbs. Shrugs: I really like this one because I want those shoulder lumps. I like to do this in between sets of other exercises. I usually a 45 lb plate in each hand. Shoulder Press: I use a machine for this exercise. You can use dumbbells or a bar but I am not there yet, so I like the machine. I am up to 60 lbs on this one. Rear Deltoid: This is another great machine that I like. It is mostly for the back, but I feel like it really does work my arms, shoulders and back. I do like this workout and would love to incorporate it more into my workout, but I have a life, and things are good. 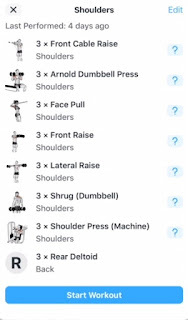 Remember this workout comes to you from the Strong APP you can download!